Punalur is a city situated near the Tamil Nadu-Kerala border in the Kollam district, in the southern State of Kerala, India. It is situated on the banks of the Kallada River, receiving its name from two Tamil words; punal, meaning “water” and ooru, meaning “town”, therefore “town of water”. It is about 45 km north-east of Kollam and 75 km north of Thiruvananthapuram. Punalur is the headquarters of Pathanapuram Taluk, the gateway to Western Ghats. It is also known as the “Lap of the western ghats”. 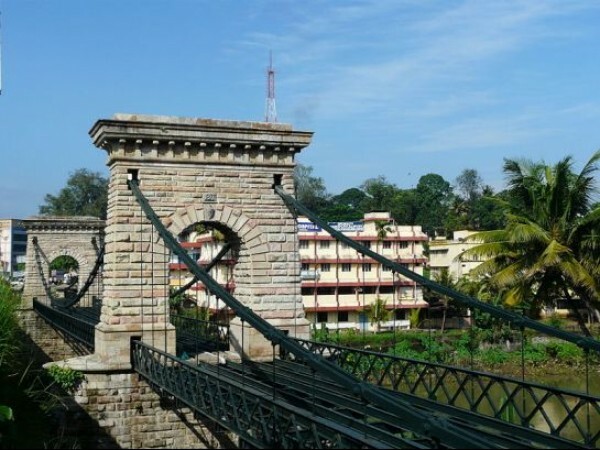 Punalur Suspension Bridge or Hanging Bridge, the ONLY ONE in Kerala and possibly in the World was built by Albert Henry, a Scottish Engineer, across the Kallada River in the year 1877. This bridge was made for vehicle movements and was made by suspending huge spans. The Punalur Suspension Bridge took more than six years to complete. Story goes that people were hesitant to walk on the bridge and hence the engineer and his family passed under the bridge in a country boat while six elephants walked on the bridge to gain the trust of the people. 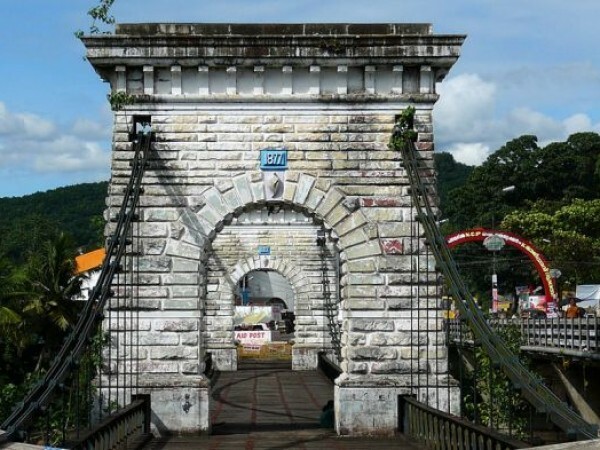 The bridge was constructed with the aim of preventing wild animals intruding the human settlements of Punalur which was then covered with dense thick forest on one side. A concrete bridge would allow the animals to pass, but a suspension bridge would not. This is because of the fact that the bridge would start shaking if someone passed on it and this will scare the wild animals away. The bridge is supported by four deep wells, and the iron rods of the bridge are connected to the clips in the well. Each of these wells is about 100 feet deep. This ancient hanging bridge of Kerala is built of linked bar chains which are bolted with huge nuts and steel rod hangers which joins the chains with the deck. Two pillars supports the chains which inturn supports the deck. The chains runs through the top part of the pillars and the deck is laid through the pillars and supported at both ends of the bridge . The bridge is said to be a non-cement construction. Inside one of the Four wells on both sides of the hanging bridge. The two ends of the twin steel bar chains which supports the bridge are anchored into these wells. The chains are made to pass through the pillar tops, basements on bridge entrances and finally fixed deep inside these wells. It would be possible that the wells are interconnected for weight distribution but this is not a surety though. Could the wells be used as air-shocks to cushion the when force is applied to the bridge and the steel wires pull it back when it buckles therefore when the animals walk across the bridge, it shake. Animals such as elephants would make it shake not cows, tigers etc. Could the wells be used to cushion the force if the shake is more than expected as the springs on the ground floor in lifts? After some research on the internet I found that the only mention of Albert Henry, the architect of Punalur Bridge is mentioned only in local blogs, locally or in Indian Newspapers. There are no schematic diagrams or blue prints of the Punalur bridge but Howrah Bridge has blueprints and the structure is well documented in almost all aspects. I have not seen another bridge that has been constructed in this manner, style and purpose not to let animals across the bridge in to human habitation. Could it be possible that there is no actual Albert Henry and somebody else would have designed and built it. I appreciate the write up on the Punalur bridge, however some factual errors are there which is brought to your notice as under. 1. 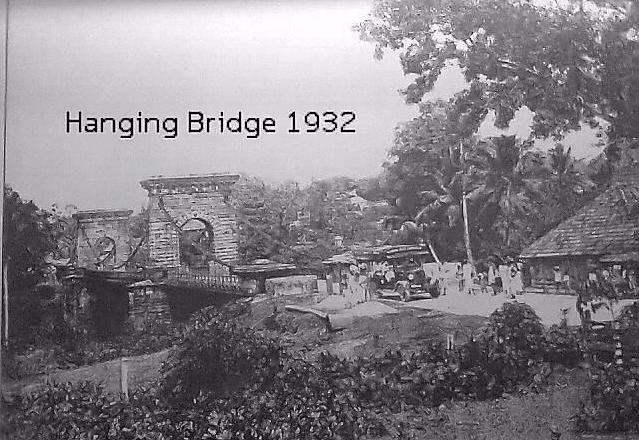 When the Punalur suspension bridge was constructed cement concrete was not invented . For that matter cement also not invented yet. Stone masonry columns with arched bridge deck filled with soil and sand and paved with stone was the normal construction method for bridges in those days. The span of arch will be minimal and hence many columns are to be located in the in the middle of the river. Kallada being river with extreme slope and hence the discharge is heavy. .It was common in those days the columns under construction in the river were flown off many times. This forced the administration to find other mode of construction. For the suspension bridge only two main columns that are placed close to the shore of river where the discharge is relatively less and the masonry columns are safe till date. Added advantage may be the avoidance of animal passage. 2. Albert Henry is only the site engineer. The entire bridge except stone and wood work was designed and constructed in Engalnd . So this bridge is almost an imported bridge. Bridge parts shipped to kollam port and brought to Punalur using massive wooden carts pulled by elephants and it took a month to reach the site from kollam. 3. The stones are bound by a special mixture of burnt lime shells , sand and a traditional adhesive made from the bones of animal. For grinding the mortar they used oxen and on top of a flat rock near High school Punalur you can see the reminiscence of this work. The ground mortar is brought from that far to construct the column and end wells stone by stone. 4. This bridge is much older than any othe suspension bridge in India. And was working till 1972 . I have seen fully loaded lorries and buses passing through it while I was walking through the bridge I too travelled in buses,cars passing through the suspension bridge. Thank you for your understanding and suitable correction in your article. That’s interesting and even more if you have some links to show that the bridge was actually made in England.